More pictures here, from Ramil's Flickr! 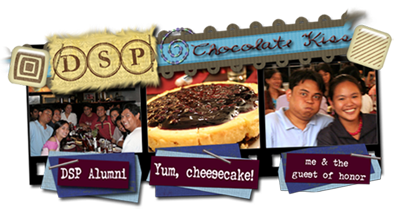 Well, as I mentioned ago, me and a few college buddies met up last June 23 at Chocolate Kiss in UP Diliman. Somebody has a girlfriend na, another person has a punked-up hairdo (who according to Ramil looks like TAFKAP, but Ma'am Gev says he looks more like Marvin Agustin hehe), then another one is again resigning and moving on to another job, while the others, well, they just got huge [kasama nako dito haha pero definitely si Reghz hindi haha].